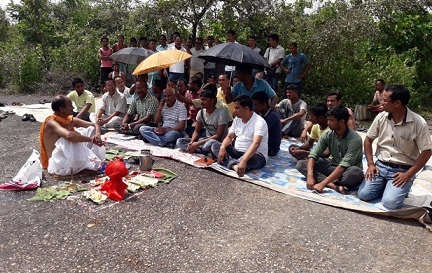 The bhumi pujan ceremony for the revival of Rupsi Airport at Dhubri in Assam, which has been lying defunct for the last five decades, has finally been held in presence of the locals and officials of Airports Authority of India (AAI) at the airport premises on Wednesday. Locals, while expressing happiness at the Central government initiatives, said that the affordable regional connectivity by air could soon be a widespread reality for the inhabitants of Dhubri and its adjourning areas including the Bodoland Territorial Area Districts (BTAD). B Pandey, deputy general manager (DGM), AAI, who arrived here along with other officials of AAI said that the government has released an amount of Rs 40 crore as first instalment for revival of the airport and the work order has also been allotted to East India Company (EIC). “The East India Company will start the foundation work for revival of the airport including cleaning of the jungles which have spread in and around the airport,” said Pandey. “The EIC will complete its tasks within one year with effect from today and the new tender will be given for other development related works of the airport in the due course of time,” added Pandey. The revival of the Rupsi Airport has taken place under Prime Minister Narendra Modi’s Udaan II scheme which proposes rejuvenation of five airports in the northeastern region including Rupsi Airport. The air service has remained suspended now. The airport, which covers an area of 447 acres (181 ha) at an elevation of 131 feet (40 m) above the sea level with 6,000 ft runway which can handle any type and size of aircraft. Notably, the Bodoland Territorial Council (BTC) authority has recently handed over around 337 acres land out of the 448 acres to the AAI. Once it is made operational, the airport will emerge as a blessing for passengers from the entire Lower Assam districts including Dhubri, Kokrajhar, Bongaigaon and Goalpara besides Garo Hills in Meghalaya and West Bengal as well and even few parts of neighbouring Bhutan.